Chinese higher education has been actively developed in recent decades as a major engine of national prosperity. This investment has spurred substantial and growing interest in understanding student and graduate outcomes. After discussing this policy context, the paper deploys an international lens to analyse evaluation mechanisms being used and developed in China. Specific initiatives are discussed to particularise each mechanism and to help link them with international developments. The paper’s final section reviews China’s apparent progress in this field and concludes by considering the growing role of technology in future policy development. This paper is an outcome of the research supported by the Key Project of Philosophy and Social Sciences Research, Ministry of Education, China (Grant No. 17JZD056). AACSB. (2018) Accreditation. https://www.aacsb.edu/accreditation. Accessed 4 Jan 2019. ABET. (2018) Accreditation. https://www.abet.org/accreditation. Accessed 4 Jan 2019. China Academic Degrees and Graduate Education Development Centre (CDGDC). (2018) Overview of the fourth China University Subject Rankings (CUSR). http://www.chinadegrees.cn/xwyyjsjyxx/xkpgjg/2016phden/index.shtml. Accessed 4 Jan 2019. China Internet Network Information Center (CNNIC) (2019) The 43th Internet Development Report. http://www.cnnic.net.cn/hlwfzyj/hlwxzbg/hlwtjbg/201902/P020190318523029756345.pdf. Accessed 4 Jan 2019. Higher Education Evaluation Centre (HEEC). (2018) The Introduction of the Higher Education Evaluation Center of the Ministry of Education. http://www.heec.edu.cn/en/enAboutHEEC_d.jsp?id=208. Accessed 4 Jan 2019. Ministry of Education (MOE). (2011) Opinions of the Ministry of Education on the Evaluation of Undergraduate Teaching in Ordinary Colleges and Universities. www.moe.edu.cn/srcsite/A08/s7056/201802/t20180208_327120.html. Accessed 4 Jan 2019. Ministry of Education (MOE). 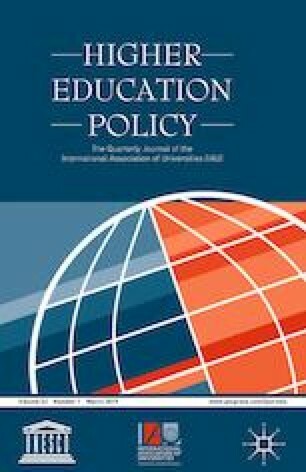 (2016) Education Action Plan for the Belt and Road Initiative. Beijing. https://eng.yidaiyilu.gov.cn/zchj/qwfb/30277.htm. Accessed 4 Jan 2019. Ministry of Education (MOE). (2017) Coordinate Development of World-class Universities and First-class Disciplines Construction Overall Plan. www.gov.cn/xinwen/2017-01/27/content_5163903.htm#allContent. Accessed 4 Jan 2019. Ministry of Education (MOE). (2018) Midwest Higher Education Revitalization Plan. www.moe.gov.cn/s78/A08/A08_ztzl/s7394. Accessed 4 Jan 2019. Ministry of Science and Technology (MOST). (2018) Statistical Analysis of China’s Universities. www.most.gov.cn/kjtj. MyCOS. (2016) China University Student Employment Report 2016. www.eol.cn/html/c/16dxsjybg. Accessed 4 Jan 2019. Organisation for Economic Cooperation and Development (OECD). (2019) Enhancing Higher Education System Performance: Benchmarking higher education system performance. https://www.oecd.org/education/skills-beyond-school/benchmarking-higher-education-systems-performance.htm. Accessed 4 Jan 2019. Shanghai Ranking. (2018) Academic Ranking of World Universities. www.shanghairanking.com/index.html. Accessed 4 Jan 2019. State Council of the People’s Republic of China (State Council). (2010) National Medium- and Long-term Talent Development Plan (2010–2020). http://old.moe.gov.cn/publicfiles/business/htmlfiles/moe/info_list/201407/xxgk_171904.html. Accessed 4 Jan 2019. State Council of the People’s Republic of China (State Council). (2015a) The Overall Plan for Promoting the Construction of World-class Universities and Disciplines. www.gov.cn/xinwen/2015-11/05/content_5005001.htm. Accessed 4 Jan 2019. State Council of the People’s Republic of China (State Council). (2015b) The Opening of the 15th Meeting of the Leading Group of the Central Committee on Comprehensive Deepening Reform. www.gov.cn/xinwen/2015-08/18/content_2915043.htm. Accessed 4 Jan 2019. United Nations Educational, Scientific and Cultural Organisation (UNESCO). (2015) Online, Open and Flexible Higher Education for the Future We Want. https://iite.unesco.org/files/news/639206/Paris%20Message%2013%2007%202015%20Final.pdf. Accessed 4 Jan 2019. United Nations Educational, Scientific and Cultural Organisation (UNESCO). (2019) Global Education Monitoring Report. https://en.unesco.org/gem-report/. Accessed 4 Jan 2019. Wei, J. (2017) China’s Leading Position in the Field of Artificial Intelligence: Will Become a Global Leader. www.cankaoxiaoxi.com/china/20170829/2225500.shtml. Accessed 4 Jan 2019. World Bank. (2019) Systems Approach for Better Education Results (SABER). http://saber.worldbank.org/index.cfm. Accessed 4 Jan 2019. XuetangX. (2018) About Us. www.xuetangx.com/about#about_us. Accessed 4 Jan 2019.